I've noticed an interesting pattern over time. To my surprise, I've received reflection photographs from several researchers, each of whom who had no idea any other had done the same. I was thrilled and delighted when the images arrived. They floated into my inbox and consciousness like mirrors in the mail. The fact that these hard-thinking scientists felt inspired to take, and then share reflection photographs after hearing me lecture on how I do mine, told me two things. One, that my lesson "took": that I pierced their consciousness in such a way that they found themselves willing to act as I do. Like mirror neurons, they tried on my eyes to get a closer look at how I see, which is my ultimate goal: to help people see. 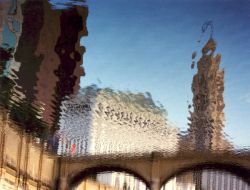 When you take a photograph of a reflection, you must compose your image upside down -- an odd and difficult task. Eventually, it is simply easier to give in and rely on other parts of your mind to compose the image. So, in an oxymoronic way, seeing in reflection "forces" you to let go, to trust what you feel. Second, these images opened a unique window into the mind of the researcher. Remember the Heisenberg Uncertainty Principle that states every object observed is changed by the experience? Well, I am the voice from the other side, the voice of the object that was watching them the whole time they were watching me. I have learned that we change each other through our interchanges. And while it is hard for me to quantify what I have learned from them, it is a great deal. Their questions and responses provide a framework onto which I can project what I intuitively know but do not usually speak. My hope is that by sharing information with them, I might assist in their search for the key that unlocks the secrets of synesthesia, might provide a small hint of how to break the code of what must certainly be The Dead Language of Childhood. 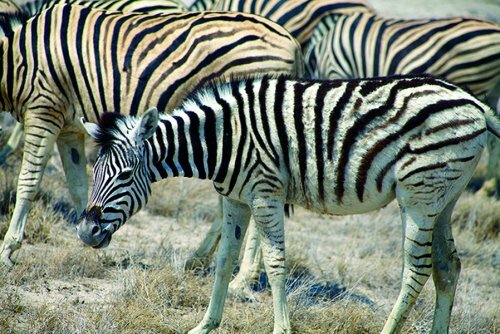 It is fascinating to see how researchers learn from the give-and-take of encounters with a live subject. Their reflective photographs show me better than words how they process and learn. In addition, their pictures induce my synesthesia, each in a different way. Reflection photographs are much more than mirrors of the sky: they are mirrors of the mind. I hear ancient strumming from the quivering lines while the interplay of shadow on reflection evokes a feeling of expansion which sends me oscillating between the layers. The juxtaposition of arc and angle, produced by the round leaf inside the triangle of flowers, produces a sensation of counterpoint. But my most visceral response is evoked by the flower on the right: when I look at it, I feel wet around my edges. All three of the flowers are dancing. When I read Karthik's words below, I wondered how different we really are. As he describes them, his creative process and relationship to light are so similar to mine, I wondered if my synesthesia (or his lack of it) was no more than a thin veil of unawareness between us. Could his looking at reflections help to dissolve or ameliorate or thin out that layer to reveal the wondrous? I think of synesthesia as a perceptual curtain or sheath that is part of the layering of consciousness: becoming aware of one's synesthesia is removal of the first layer. This was in a forest in South India during the monsoons. A few lilies floating around beneath a dreamy evening sky. Dusk approaching, calm, wild surrounds of the pristine BR Hills. And the lilies seemed immersed in the reflection of the sky, somewhat like the interplay of sensations we see in synesthesia. It has a calming effect on me, the green, the grey, the twilight. Tell me what you think, what you hear? Just seeing some of your pictures made me feel good. I love to capture a moment in my mind and on my camera and would give anything for that. When I succeed, the high I experience is better than most other feelings of pleasure. I am not synesthetic but I do know that certain feelings I have, few others comprehend. It is when I can't effectively share some of these, that I feel a bit off. I love the reflection, the play of light and that is the essence of photography. If you think of it, that perhaps is the essence of sight itself. I am glad I was able to shoot that picture and then even share it with you. Needless to say, meeting you, getting to see your art made me appreciate my picture better. Dr. Crétien van Campen is a psychologist, writer and synesthesia researcher outside of Amsterdam. He has written a book on synesthesia, Tussen zinnen Synesthesie of hoe de zintuigen samenwerken (Between Senses. Synesthesia or How the Senses Cooperate). Crétien takes the unique view that synesthesia is a cooperation between the senses rather than a confusion of the senses. We met at Rockefeller University in 2003 when we both gave presentations in a Neurogenetics Lab. Six months ago, I sent him an e-mail to ask if his book had been translated into English yet. He answered no, then asked if I would be interested in reading a rough translation. When I said yes, he began to write one. My initial job was editing, to make sure his English sounded natural to a native ear. But as I lifted linguistic layers to identify correct meaning below, I found that I didn't always agree with his conclusions. We'd go back and forth like shuttles on a loom, agreeing, disagreeing, agreeing, disagreeing, an exchange between researcher and synesthete that was ultimately enlightening for us both. In the end, we had both altered our view. Done entirely by e-mail, it felt like a transatlantic game of Cat's Cradle, the string held between two hands -- one his, one mine. Once, to make a point, I gave him an assignment. I sent him to my website to look at my image "House of Leaves" and suggested he study the levels of transparency in the water. 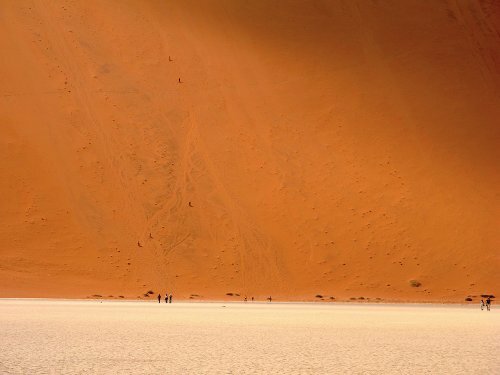 It is an excellent image for practicing multi-level vision because you can be in more than one place at a time just by varying your focus. As with most acts of teaching, however, I had no way at the time to know if he understood. He didn't mention it, we got busy editing, and then I forgot. Soon after, he sent me the remarkable reflection above. When I read his words (below), I saw that he had more than understood; he had incorporated the lesson inside. On the right, I see a massive Teutonic headdress lying on its side, its spikes provided by turrets and steeples. They remind me too of what you might see on a Viking helmet. On the left, I see a little red mouth that is actually a boat married to its reflection. In December 2005, I gave a lecture on synesthesia at the Academy of Fine Arts in Gent, Belgium. I spent a few days in this magnificent Medieval town that once was a center of trade in Europe. The canals and the rich decorated facades of mansions and storehouses remember that gothic time. 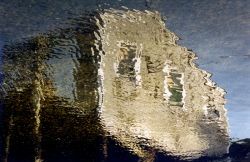 Before leaving for Gent, I had been corresponding with Marcia intensively, and taking my walks with a camera in my pocket through the historic centre, my eyes were drawn by the reflections on the water. With the pictures of Marcia on my mind, I tried to picture some reflections. But they failed (as I could see in the small window of my digital camera). Instead of taking pictures I started to look again with my own human eyes. And slowly my ‘doors of perception’ were opened. 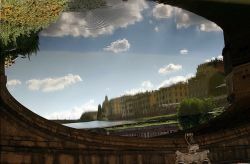 First, I just saw reflections of mansions in the water, but soon I discovered more layers. 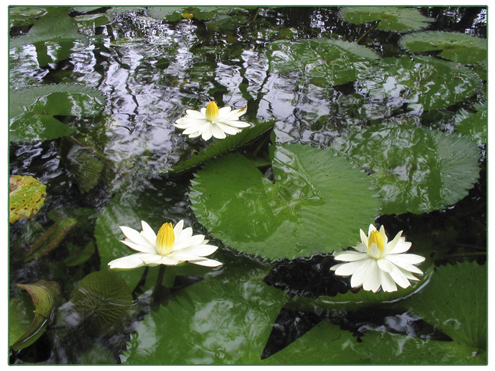 I perceived the floating plants and dirt on the surface that decorated the outlines of the mansions. I saw the changing clouds that gave and took the light like in a Rembrandt painting. Sometimes a fish down deep came by. More than my camera could ever do, my eyes showed the layers of the visual world. My eyes could change focus from layer to layer, from the floating plants on the surface to the white and black clouds deep down. 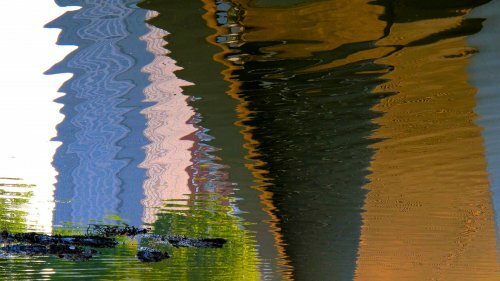 I discovered the richness of the visual world in the reflections on the water. Somehow it was more interesting than the visual world above water level. The last morning in Gent, I strolled back to the station with my suitcase. And suddenly I was struck by a strong visual “Gestalt” arising from the water. I took my camera and just clicked. Later I realized this spontaneous picture was better than all the reflections I had taken the last days. I don’t know what makes it quality. It was not me, the situation was there and I clicked. 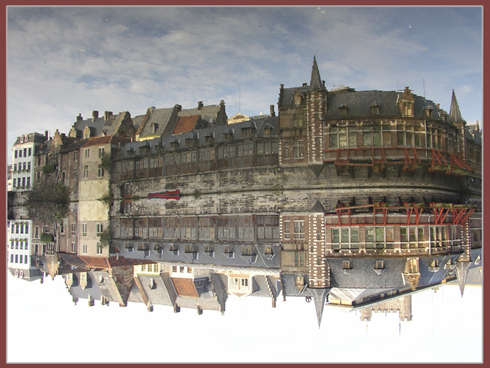 "Een reflectie op reflecties in Gent"
In december 2005 gaf ik een lezing aan de kunstacademie in Gent in België. Ik bracht een paar dagen door in dit prachtige Middeleeuwse stadje dat ooit een belangrijk Europees handelscentrum was. De kanalen en de rijk versierde façaden van herenhuizen en pakhuizen riepen herinneringen op aan de glorieuze gotische tijd. Voordat ik Gent bezocht had ik intensief gemaild met Marcia. En terwijl ik door het historische centrum slenterde, met een camera in mijn jaszak, werd mijn blik getrokken naar de weerspiegelingen op het water. Met de foto’s van Marcia in gedachten, probeerde ik enkele weerspiegelingen op het water te vangen met de camera. Maar ze mislukten (zag ik in het kleine venster van mijn digitale camera). 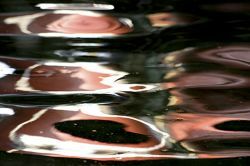 In plaats van te fotograferen, besloot ik maar weer met mijn eigen ogen te genieten van de reflecties in het water. Eerst vielen me de weerspiegelingen van de herenhuizen op, maar al snel ontdekte ik meer lagen. Ik zag de drijvende planten en wat vuil op het wateroppervlak, die omtrekken van de herenhuizen decoreerden. Ik zag de veranderende wolkenpartijen die als in een schilderij van Rembrandt het licht gaven en namen. Soms kwam een vis in het diepe voorbij. Beter dan mijn camera ooit zou kunnen, lieten mijn ogen de lagen van de zichtbare wereld in het water zien. Mijn blik stelde wisselende scherp op verschillende lagen, van de drijvende planten op het wateroppervlak naar de witte en zwarte wolken in het diepe. Ik ontdekte de rijkdom van de zichtbare wereld in de weerspiegelingen van het water. Op een of andere manier vond ik dat interessanter dan de wereld boven water. Op de laatste ochtend in Gent, wandelde ik met mijn koffer terug naar het station. 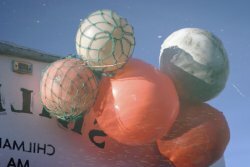 Plotseling werd ik getroffen door een sterke visuele “Gestalt” die uit het water oprees. Ik pakte snel mijn camera en klikte. Pas later realiseerde ik dat deze spontane foto beter was dan alle reflecties die ik in de voorgaande dagen had gefotografeerd. Ik weet niet wat de kwaliteit van deze foto precies bepaalt. Ik was het niet, misschien was het “het beslissende moment”, de gelegenheid was er eenvoudigweg en ik klikte. Is it any wonder that his beautiful reflection looks like a dream? It could even be a scary dream, except for the safety of the yellow. I noticed too that if I cover the sky, the house turns into a child's drawing with exaggerated geometry and distortion in perspective. For me, though, the power of this image lies in its archetypal overtones and undertones. After I received it, I was flipping through a book of dream-inspired art when voila! I came upon a painting by a German artist painted sixty years ago and instantly felt a gestalt of recognition: for despite superficial differences, archetypically they felt the same, as if they had reinvented the same shape. I took this revelation as evidence that we cannot help ourselves: we are destined to unconsciously repeat certain necessary patterns. It is one of the things that ties us together throughout time. When I recognize this connection, it reassures me that the universe is friendly. 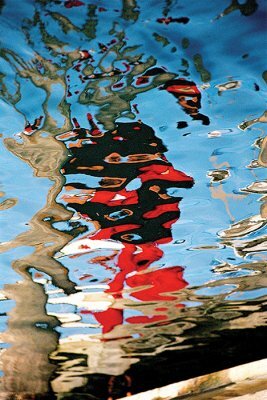 I find that the imagery of reflections is often the same as dreams. When you compose upside-down, you cannot help but project internal states of being onto what you see. In that sense, your eyes function like emotional periscopes that pull up data you read outside. In the case of Markus Zedler, what does the data reveal? What images from his interior life did he pull up and put on his screen? His title "View from the Window" is redolent with multiple meaning. It immediately makes me ask, which window, which view does he mean? Is it the window through which he was looking when he came upon this scene? Or, does he mean the window within the reflection? If so, what would be the view? How would he get to that window? 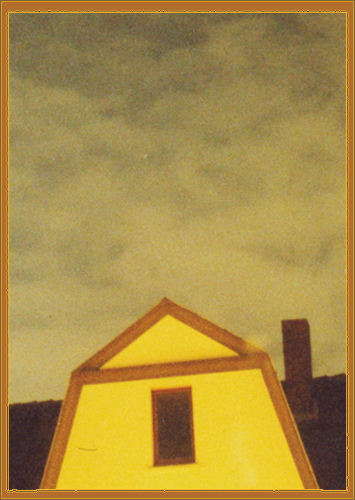 He would have to climb into his photograph, walk into that house, go up the steps, turn around and look out: only then, what would he actually see? He'd see himself, looking from the other side, face-to-face with his doppelganger or deepest self none of us normally sees. Such is the nature of reflections. Hopefully, Dr. Zedler will soon give us some hints about the picture's meaning in his own words. Dr. Edward M. Hubbard has a Phd in Cognitive Neuroscience and is currently doing his Post-Doc in the neural bases of numerical cognition and synesthesia at the French Institute National de la Sante et Recherche Medicale (INSERM). I met Dr. Edward M. Hubbard at Rockefeller University in 2003 when we both gave presentations at a Neurogenetics Lab. We met again at subsequent conferences on synesthesia, most recently in Houston at the American Synesthesia Association meeting last year. I know Ed best, however, from his writing. He is one of the best science writers I have ever read. His contributions to the American Synesthesia List, where he writes lengthy informative responses to questions by synesthetes, are so well-written, I save them for their writing value alone. He makes science, which is clearly his passion, accessible and understandable. I was surprised and delighted to receive his wonderful reflection in my e-mail. What I SEE: I hear a chord of color when I look at Ed's reflection, though I noticed something interesting. If I cover up the blue with my hand, the sound goes away. At the same time, I become aware of the doubling of the red and yellow which I had not noticed before. That awareness in itself suppresses sound. If I cover up the green, I still recognize the possibility of sound, but I cannot hear it. If I cover up the blue AND the green, the music goes away completely, even as a possibility. This has more to do with the positioning of the colors and the doubling of two of them than it does with the colors themselves. If I could put the Paris lights in my hands, I would keep rearranging them to see what other combinations produce a chord. I have always loved the reflection of light on water, especially at night. I remember falling asleep as a child, with my head on hands looking out at San Francisco from my window, the lights of The City reflecting off the waters of the The Bay. Now, living in Paris, I find myself attracted to the same thing; the lights of the City of Lights, reflecting off her most famous waters, the Seine. When I took this picture, I was particularly attracted to two things. 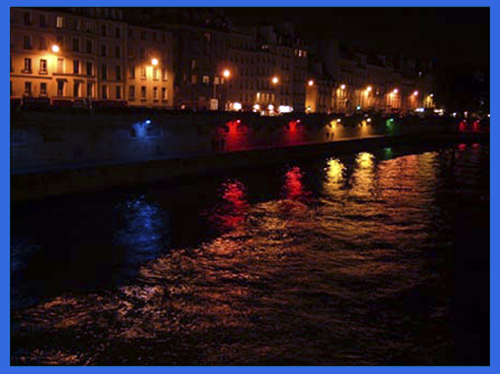 The first thing is the brightly colored lights along the quay that lines the far side of the Seine, and the comparison with the yellowish-white lights from the buildings. The second was the pattern of light off the waves. What I find interesting here is the two patterns of waves, those far from the viewer, where the calmer water reflects the colored lights, and those close to the viewers, where the choppy water, churned by the passage of a tour boat, reflects only the diffuse colored light, and more white light from the buildings further away. In some ways, too, this picture gives me the impression of two different artistic styles. The upper half of the picture seems almost hyper-real, with its brightly lit, angular geometric forms, while the bottom half is colorful and has no clear forms, but is more evocative.